Keep’em at home for now. After a few weeks of backlash against the idea from the airline industry, flight attendants and air marshals, the Transportation Security Administration has decided to delay lifting the ban against small knives aboard airline flights. 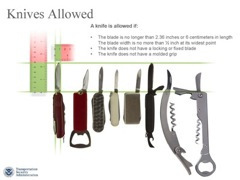 A few weeks ago the TSA said passengers would be allowed to carry knives that met certain descriptions, as well as some sporting equipment. The TSA announced its change in tune yesterday, saying it was delaying the policy change so that the airline industry, passenger advocates and law-enforcement experts could weigh in on what should be allowed on planes. Pistole originally announced a few weeks ago that blades up to 2.36 inches that were fixed and met other requirements would be allowed on flights starting April 25, but subsequently faced a loud outcry from flight attendants and law enforcement who opposed the change in the rules. Pistole later admitted he could’ve rolled out the idea in a better manner. The Flight Attendants Union Coalition had argued vehemently against the change, and expressed its approval of Pistole’s recent move saying the timing is just not right for potential weapons floating around on flights.